Luckily for us, we seemed to get there right before the spring break rush, and we instantly felt as though we had the place to ourselves. The private beach at the Jamaica Inn prevents those ever annoying beach salesmen from interrupting your bliss, and the beach itself is one of the most beautiful I have ever been to. 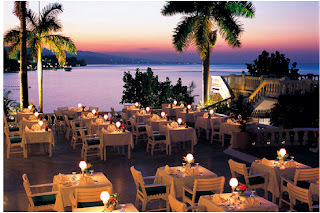 Dinner is served on a beautiful terrace overlooking the ocean, and every dinner is proceeded by cocktail hour. What ever happened to cocktail hour being an institution? Who knows, but its re-emergence in Jamaica was just perfect. I love the simplicity of the white painted furniture, white tablecloths, and blue seat cushions–so simple and just so elegant. As one would expect, the Jamaica Inn is not without its one storied past. Recognize that couple at the table? 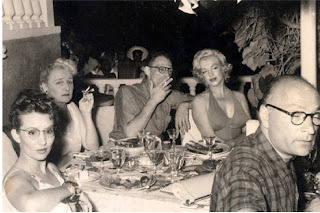 That’s the playwright Arthur Miller and his wife Marilyn. 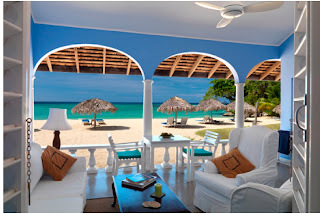 Built in 1950, the Jamaica Inn has played host to many well known figures, from the couple above, to Winston Churchill. The decor at the Jamaica Inn has that british colonial quality that always seems so appropriate in many an island location. However, instead of being overdone, it is extremely simple … it relies on the views from the room instead of the views inside the room. 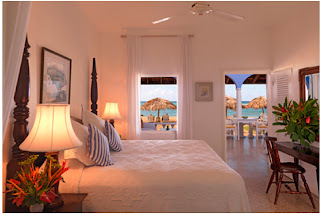 Blue and white, and dark wood furniture are the rule of the day at this hotel, and when you throw open the louvered shutters those views draw your eyes right out of the room and to the blues of the ocean. Our room extended into a verandah, which looked out over the impeccable beach. The verandah was decorated with white slipcovered furniture and a seagrass rug … how impossibly chic. Ahhh yes, and croquet. A game that I have a newfound respect for. Because what would a vacation to a british colonial island paradise be without croquet? Well, don’t knock it until you have tried it because I had some pretty competitive matches while I was at the Jamaica Inn … all while drinking a Vodka Collins (my new favorite drink). The whole hotel is painted the most beautiful shade of blue (perfect for me, right? ), and I asked the owner what blue it was and he said Wedgewood Blue. Does anyone know what paint company makes it? It is a beautiful color with an almost hydrangea quality to it. It was perfect. There was so much inspiration to be had at the Jamaica Inn, look out for it creeping into my posts over the next few weeks. I’m back in Philadelphia, in the rain, but the sun and the colors of the Jamaica Inn are still lingering … and I hope these have helped to warm you up too. Looking at these shots of that place makes me want to let out one big aaahhh. I love Ochos Rios! So jealous and dying to go back. I love the picture of you & W on the beach!